Once your wholesale flowers have been delivered, they will need conditioning before they are arranged. Conditioning will ensure that the flowers are in the best condition for the maximum possible amount of time. Flowers should be unpacked immediately on arrival. Remove all packaging material. 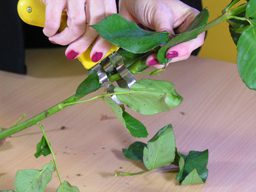 A good inch should be cut from the stems at a 45 degree angle with a sharp knife – do not use scissors, as they will crush the stems and prevent water freely flowing up to the flower heads. Air locks in the stem are the most common cause of wilting. Please note: STEMS SHOULD NEVER BE HAMMERED OR CRUSHED. Strip the lower foliage from the stems. Any leaves that are left under water will start to rot – this will cause a build up of bacteria and may block the stem ends as well as feeding the flower heads with the bacteria. Fill your flower buckets between a quarter & one half full with luke warm water. Add flower food at the appropriate rates, (flower food will help prevent bacteria). 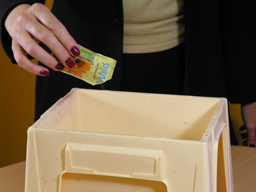 All buckets must be spotlessly clean to prevent bacteria. Flowers should be left in water for at least 2/3 hours before arranging and preferably overnight. 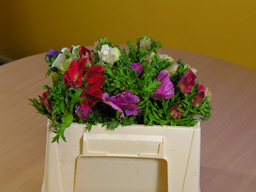 Never leave your flowers near a radiator or in a draft and always keep out of direct sun light. Cut stems at a 45 degree angle using a sharp knife. Fill clean buckets with warm water – add flower food. 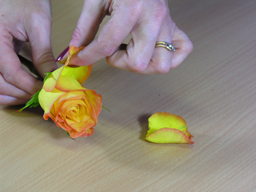 The outer petals on roses are called ‘Guard Petals’. They are often darker in colour and thicker than the inner petals. These can be carefully removed. Condition in the same way as Woody Stems. Immerse up to their necks in water. Turn stems upside down & fill the hollow stem with tepid water. 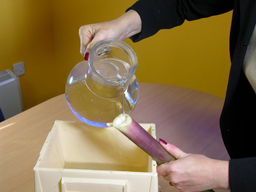 Hold thumb over the stem until it is placed into bucket of warm water. Cut off the white firm end of the stem with a sharp knife. Fill clean buckets with cold water – add flower food. Daffodils exude a poisonous sap when cut. This will kill other flowers if conditioned in the same water – always condition separately. Single leaves can be totally immersed in water to condition them. Shiny, smooth foliage can be washed. Leaf-shine can also be applied. Carnations and spray carnations should have their stems cut between the joints. Tulips will always bend towards the light. Wrap in newspaper when conditioning to keep them straight. Remove all foliage from lilacs, (syringa), and forsythia so sufficient water reaches the flower head. Remove lily stamens. The pollen will stain skin, clothes and furnishings. Cover mimosa flower heads with a plastic bag when conditioning to stop them drying out. Some flowers can still wilt even after conditioning. Roses are a good example! Should this happen: re-cut the stems and place in near boiling water – this will destroy the air lock. Wrap the flower heads in tissue or newspaper to protect them from steam. Leave in water for approx. half an hour. When the flowers are revived, re-cut the stems, as the boiling water will have damaged them. Continue to condition before arranging.